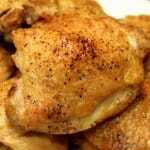 Sweet, tender and tasty. 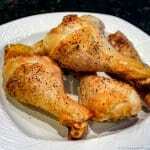 An easy side dish for that special meal. 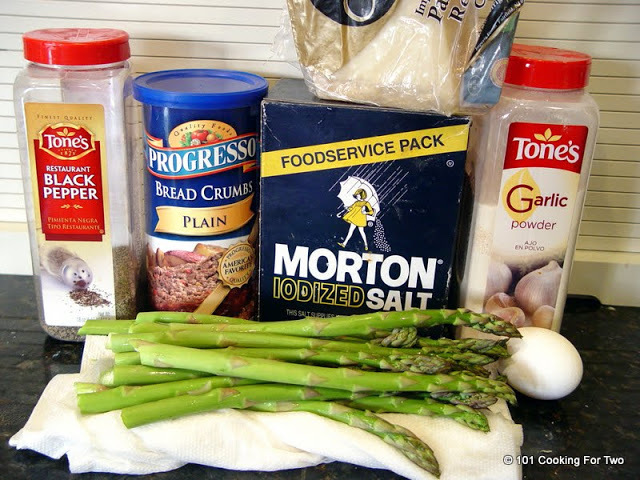 Start with fresh asparagus, coat with some Parmesan, bread crumbs and spices and bake until tender. And you end up with something special. Notes: as usual, I read a lot of recipes but don’t have an inspired by for this. 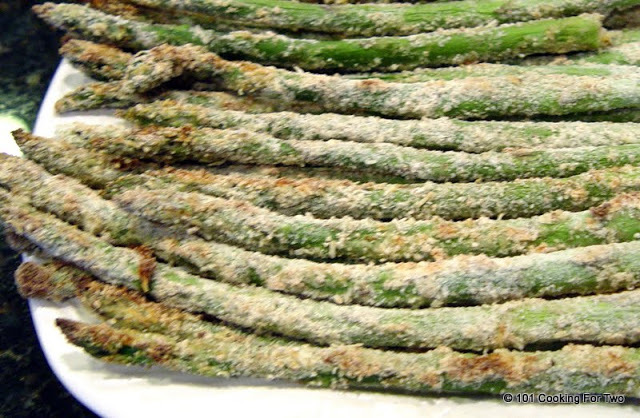 Many bake asparagus recipes baked the asparagus and sprinkled some Parmesan on at the end. 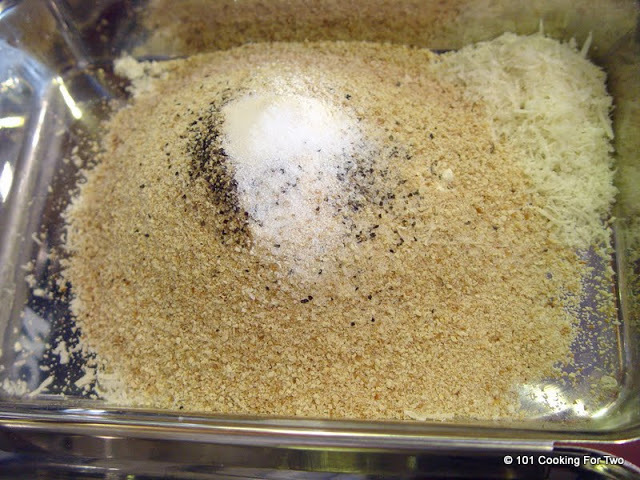 Others had Panko bread crumbs and a little Parmesan. 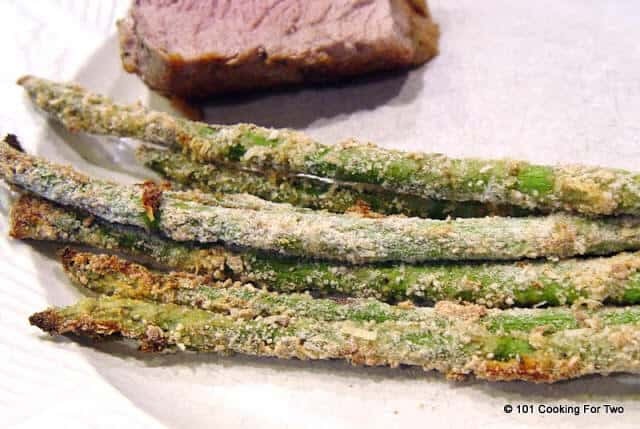 I wanted more Parmesan and some garlic, so this is my take on baked asparagus. Preheat convection oven to 400. 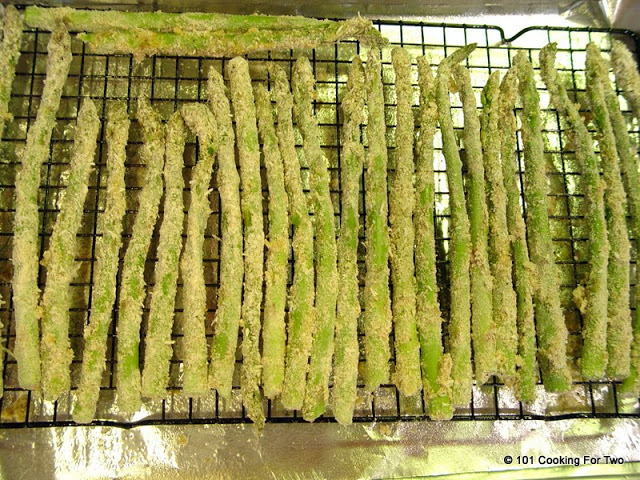 Wash and trim or snap the asparagus. Pat dry. In one pan beat one egg with a tablespoon of water. 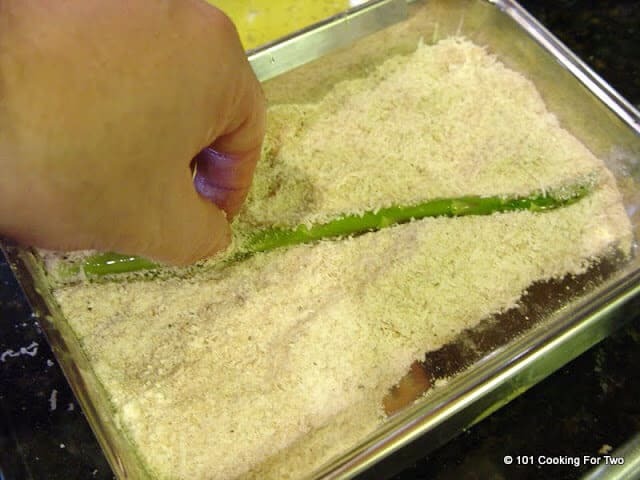 In a second pan, mix 1/2 cup shredded Parmesan, 1/2 cup bread crumbs, 1/4 cup flour, 1/2t salt, 1/2 t garlic powder, 1/4 t pepper. 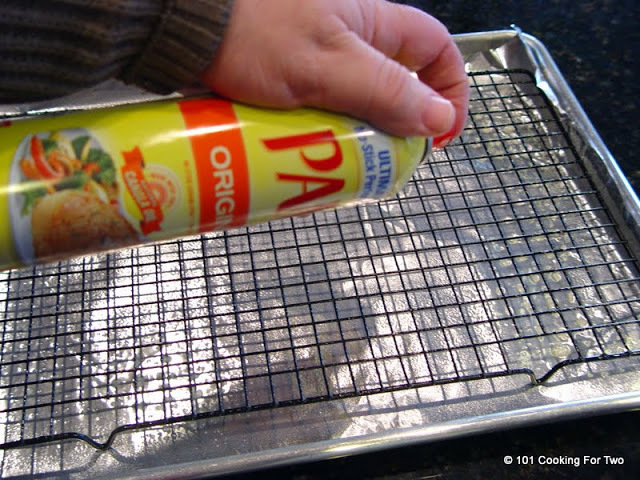 Prep a large baking pan with foil and a rack. Spray with PAM. Roll each piece of asparagus in the egg. Then roll in the dry mix. 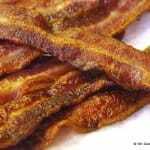 Bake for 15 to 17 minutes until browning some. Preheat convection oven to 400. 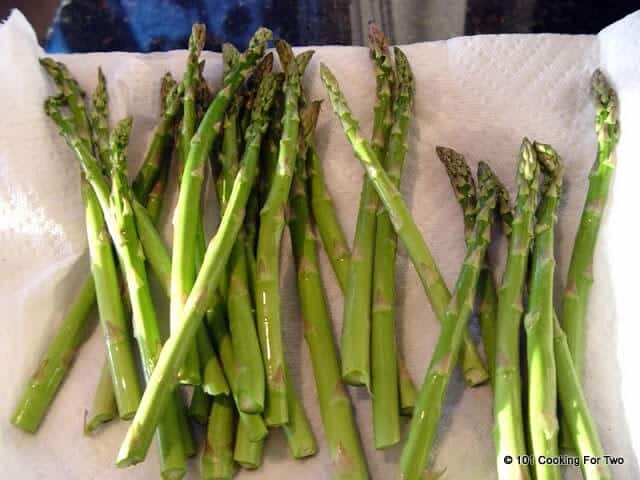 Wash and trim or snap the asparagus. Pat dry. 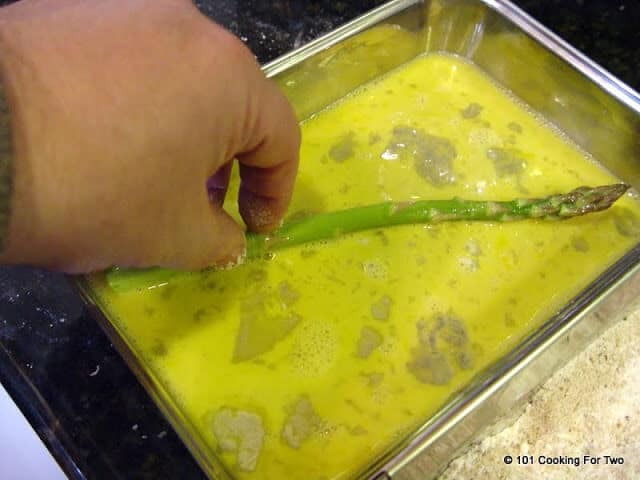 Roll each piece of asparagus in the egg. Then roll in the dry mix. Space on the rack. 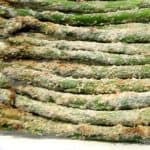 I am so glad it’s asparagus season. I also like to use the raised grid over a baking sheet technique, gets a much better all around roasting without as much turning.